Recount update: can we trust the 2016 vote? 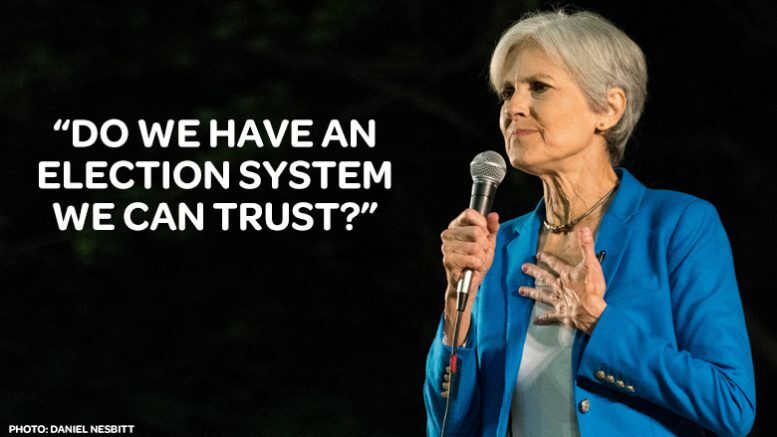 In a country that proudly calls itself a democracy, the question we raised with the 2016 recount effort was simple: do we have an election system we can trust, that is accurate, secure and just? So far, the answer is a resounding NO. In an age of commonplace computer security breaches – from the WannaCry ransomware intrusions into energy, health care and transportation, to the Equifax hack into hundreds of millions of credit accounts – it’s astounding that the security of our voting technology has still not been verified. To put it simply, an un-recountable election is a blank check for fraud and malfeasance. It is a guarantee that elections cannot and will not be verified. For that reason, we continue to fight in the court of law and the court of public opinion for a just and verifiable voting system we can trust! At the Democracy Convention in August, a number of leaders from the recount effort reported on key findings, ongoing challenges and lessons learned from the recount effort so far. Legal action continues in Pennsylvania, and we are still working with the Wisconsin Election Commission to get important information about voting machines in Wisconsin. Stay tuned for more information as it becomes available. Jill Stein and Alex Halderman, leading expert on election cybersecurity, gave a big picture overview of the 2016 recount effort. Dr. Halderman detailed the shocking vulnerability of our voting system to hacking and other forms of tampering. Dr. Stein discussed the politically-fueled opposition in the US to verifying the vote, a practice that is common in democratic countries around the world. All this underscores why we need election protection in the form of paper ballots, routine audits to verify the vote count, and cybersecurity best practices to prevent hacking of the vote. Lynne Serpe, George Martin and Rick Lass, who were on the front lines of the recount efforts in Michigan, Wisconsin and Pennsylvania, reported what happened in each state and ongoing election integrity struggles. In Michigan, political operatives leaned on partisan judges to stop the recount – but not before it exposed major problems calling the 2016 results into question. In Pennsylvania, a nightmare of bureaucracy stopped thousands of voters calling for a recount in a state that relies heavily on touch-screen voting machines banned in other states. In Wisconsin, we saw “half a recount” that glossed over the major communities of color that are most vulnerable to voter suppression. Election integrity veterans Lynne Serpe, Mark Halvorson and John Maa discuss the recent history of recounts in the US, from the 2004 Ohio recount to the 2016 recount effort, and what we’ve learned about how to create a voting system we can trust. It’s clear that the struggle for election integrity and voting justice won’t be easy or quick, but it is critical for building a real democracy. Thank you for leading the charge in this critical struggle. PS. If you have questions about the recount effort or ongoing election integrity litigation, please take a look at our Recount 2016 frequently asked questions. If you don’t see an answer to your question, please send it to us and we’ll do our best to answer it.